Oskar Blues knows how to make an entrance! 50+ events over 2 weeks plus hooking us up with some samples! Oskar Blues was kind enough to hook Josh up and he was kind enough to share, so look forward to reviews of Dales Pale Ale, Mama’s Little Yellow Pils, and Old Chub Scotch Ale. I also previously reviewed G’Knight Imperial Red, which I scored last time I was in Nashville, and I loved it! As far as I know all Oskar Blues beer are available in Cinci now except for Ten FIDY, their stout, which should be here in one or two weeks. 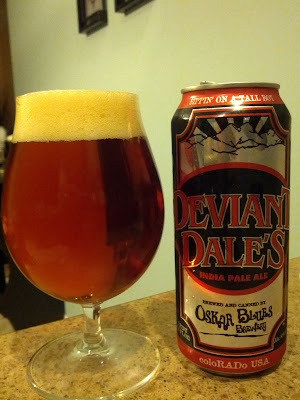 Tonight I’m checking out Deviant Dale’s India Pale Ale, which I had a few months ago but decided not to give it a full review because it wasn’t available around here. Now that that’s changed let’s get drinking! Props to myself on that perfect beer pour! Great brown color with hints of red. Topped off with a delightful off white head. This really looks like a tasty beer. Lots of citrus aromas with pineapple and pine needles as well. All that brings itself up front and center creating a potent aroma. More massive hop flavors come out in the taste again focusing on citrus and pine needles. There is some serious bitterness in this beer, not a crazy or overwhelming amount but it’ll definitely knock you around if you’re not prepared. I’m getting a wee bit of malt mixed in as it slips down the back of my throat. This is definitely an all around hop-bomb, packing a great flavor. The mouth feel is light bodied slightly sticky, and not very warming at all. I can pickup on the 8% abv but it’s not in your face at all which is awesome. Overall this is a great IPA. Sure there are better IPAs, but there are lots more that are far far worse and availability on this (now that it’s available here) put’s this in the top of the IPAs easily available to Cincinnatians. I also dig the tall boy format on this, a four pack of 16-oz cans is almost the perfect amount. FULL DISCLOSURE: This beer was sent to Josh for free by Oskar Blues, and Josh was kind enough to share. Thanks buddy! To our readers, and any breweries interested in sending me stuff, giving me free beer impacts the review in only 1 way. That way is that I WILL review the beer and I WILL write a blog post about it. Giving me free beer does not guarantee you a favorable review or that I will tell everyone to go buy it or anything like that. 10 Types of Malt You’re Not Using and Should Try!